I'd read some pretty bad things about this cereal prior to trying it, so my expectations were pretty low. Among the negative comments I'd seen: "Very odd flavor," "gets soggy too quick," and "very oddly sweet". I'm here to tell you... all those things are pretty much true. But if you're curious about this cereal, you might still want to try it. It's not necessarily a horrible cereal. It's more of a weird cereal. The pieces are two to three times larger than regular Rice Krispies pieces. The most interesting thing about this cereal is that it doesn't taste a thing like original Rice Krispies. It tastes much more like Kix or Corn Pops. The sweetness, which is provided by sugar and honey, is a little bit odd. There's almost a harshness to it, as if someone said, "The sugar and honey combination doesn't really work as a sweetener for this cereal but let's leave it in and challenge people's taste buds." The cereal gets soggy and mushy in milk fairly quickly. Don't expect the audible Snap, Crackle and Pop of the original. This cereal delivers more of a whimper and a whine... and you have to get your ear right in the bowl to hear that. Advertisements for this cereal appear to be targeted towards infants and preschoolers. It's widely speculated that this cereal is an attempt by Kellogg's to nab a share of the baby finger-food market from Genereal Mills' Cheerios. Will babies like it? It's hard to say. Babies are fickle characters. I know one baby who won't touch Cheerios, but instead prefers Morning Star vegetarian breakfast bites. I have a Facebook friend whose infant drinks out of the toilet like a dog. Now, I could make a low-blow statement like, "If your kid drinks out of the toilet, they might like this cereal." But I suspect some children with more class will also like this cereal as a finger-food. Mothers who are considering this cereal for wee ones should take note that Jumbo Krispies contain 8 grams of sugar per serving, compared to Cheerios' 1 gram of sugar per serving. Personally, I know I'll never buy this cereal again. If I finish the box, it's going to be more a matter of spending time with Snap, Crackle & Pop, my dear old cereal friends. It's fun to see them on a new box, even if the cereal inside is substandard. Nutritional considerations: Each 1 cup serving (without milk) has 90 calories, 0 grams total fat, 24 grams total carbs, 3 grams dietary fiber, 8 grams sugars, 1 gram protein, and a 10% to 25% spattering of most vitamins and minerals listed. 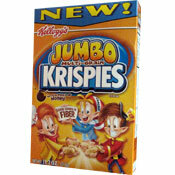 What do you think of Jumbo Krispies? I was pretty devastated when this cereal was discontinued. I absolutely loved it. My wife bought a box from grocery outlet, once I had that first bite I was in heaven. I actually went back to Grocery Outlet and bought the remaining eight boxes they had left. After the last box was finished I have been bummed ever since. I made Rice Krispy Treats with them. They were awesome. Not as sweet as the smaller Rice Krispy Cereal and a lot lighter. I made Rice Krispy Treats with the smaller cereal, too, to compare. The smaller cereal was sweeter. Definitely like the Jumbo Krispies better than the Rice Krispies. Didn't try them with milk as I do not like the regular Rice Krispies Cereal as a child or adult with milk. Love them as Rice Krispy Treats. Reminded me of captain crunch, but didn't hurt the roof of my mouth, and more nutritious. I thought it tasted like my memory of Capt Crunch but softer texture. Great for 1 year old to eat dry. He is absolutely bonkers about it. Never tried it wet, but dry it is great!!! This cereal is really bad. My 7 year old was so exited to try it and when she did she was majorly disapointed. 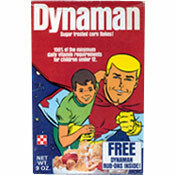 As was I, I wound up throwing away for rest of the box and I would never buy this cereal again. It will probably get discontinued soon. I don't like these rice krispies at all. They get soggy way too fast, and soggy cereal makes me want to throw up for some reason. Disagree, I really really liked it. It was slightly, but not too sweet and the texture was great. Different but really good. Little touch of honey makes it awesome. I tried this and it left a horrible coating on my tongue. It felt like shortening. My 4 year old could only eat two bites before he said- "I don't want this anymore, mom." Will never buy this cereal again.